BOSTON – Just three days after the Bruins staggered back to Boston, they’ve barged right back into the Stanley Cup finals with two brilliant blowout wins. 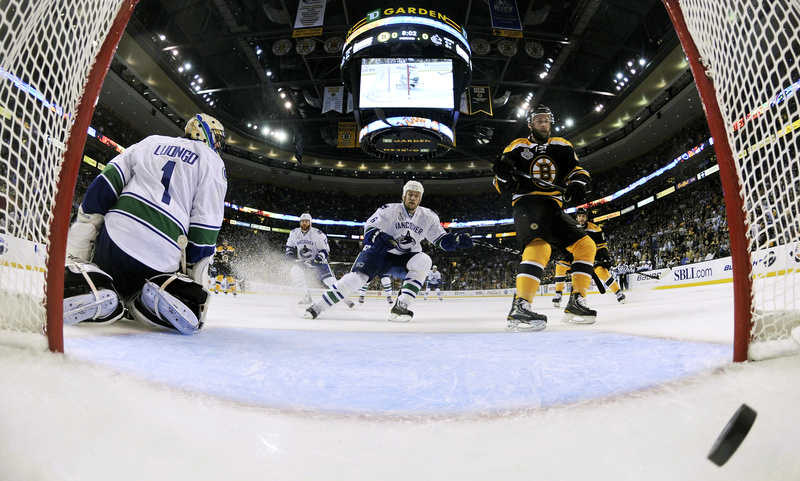 Michael Ryder and Brad Marchand also had goals for the Bruins, who chased Roberto Luongo early in the third period after Vancouver’s star goalie allowed his 12th goal in less than two brutal games in Boston. The finals are now a best-of-3, with Game 5 in Vancouver on Friday night. Game 6 is Monday night back in Boston. After outscoring Vancouver 12-1 in the last two games, the Bruins are halfway to their first NHL title since 1972 – but they’ll have to win at least once on the West Coast. The Bruins rolled through Game 4 on an emotional high that began with a stirring pregame tribute to Horton, who will miss the rest of the series after incurring a serious concussion early in Game 3 on a late hit from Vancouver defenseman Aaron Rome, who was suspended for four games. Horton thrilled his teammates by showing up in the locker room after the game. He awarded the Bruins’ jacket – a tattered, kitschy team jacket that’s been passed among the Bruins in recent months to the key player in every victory – to Peverley. Thomas was outstanding yet again. He has allowed just five goals in four games in his first Stanley Cup finals, with Vancouver’s vaunted Sedin twins – the NHL’s last two scoring champions – failing to beat him. Before the game, Bobby Orr – the Hall of Fame defenseman and Boston icon – wore his own No. 4 jersey as he waved a flag bearing Horton’s No. 18, drawing thunderous cheers while standing in the lower bowl under a spotlight. Hundreds of Canucks fans in blue jerseys joined in the cheers for Horton, who scored the winning goals in both of Boston’s Game 7 victories during these playoffs. Peverley, a Bruins newcomer after a late-season trade from Atlanta, filled in for Horton on the Bruins’ top line, lining up with David Krejci and Milan Lucic. Boston went ahead midway through the first period after Krejci alertly tapped a loose puck in the neutral zone ahead to Peverley, who blew past Raffi Torres and scored his second goal in 19 games.